2 Comments Published by Terrace Crawford on 2/24/11 at 12:02 PM. Feel free to complete the survey; however there's no incentive except for receiving cool points from yours truly. It's been a while since I've surveyed you, my dear readers, so I'm curious to see who is hanging out here. This is a very unscientific survey to determine the profile of the person reading my blog. Please want to know about you. I want to know about you. So please take a few moments to complete the survey. Your feedback will help me shape the content so that it's a better fit for you, my audience. And... to thank you for participating I'm giving away a FREE Kindle! plus some additional swag to one lucky person. Click [here] to complete the survey and enter the contest. You have until Wednesday, March 2, 2011 at 5PM (EST) to complete the readership survey and enter my little contest here. 2 Comments Published by Terrace Crawford on 2/23/11 at 2:43 PM. I really like this. 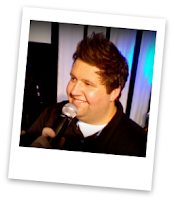 Rich Oster took the Foo Fighters track "Come Alive" and made a video using Keynote and Snapz. I appreciate the time invested in things like this. This makes a great little worship piece. I plan to use it in one of our upcoming worship experiences. 2 Comments Published by Terrace Crawford on 2/21/11 at 6:15 PM. Spent the last 4 days nursing myself back to health. Came down with the flu last Wednesday. Glad to be back & better. Was super glad I got to participate in our services yesterday at church. Our STORY series in our student ministry is off-the-hook. Last night was intense! Countdown to #SYMC2011 is underway. Will I see you there? I won a Kindle from Jabberbox.tv last week. I want to see The King's Speech. Regardless of what you think of Justin Bieber, I think he got robbed at the Grammys. Can't believe he lost the Best New Artist category to someone who most people don't even know. Someone wished me a Happy President's Day today. My reply "What does that mean? I don't even have the day off!" I'm curious as to what Barack Obama does on this day? I would like to know how he spends his time on President's Day. Anyone? Make sure you join me on twitter. 5 Comments Published by Terrace Crawford on at 9:26 AM. Our Student Ministry band covered this song yesterday and had a lot of fun with it. It was a hit with all our students. We love our Coffey. 0 Comments Published by Terrace Crawford on 2/19/11 at 11:16 AM. One of my favorite things to do in ministry is to travel and speak to youth groups all over the nation. Not only do I enjoy speaking to teenagers (all age groups, really) but I thrive on getting to encourage youth workers while I'm with them. I love getting to see what they do in their ministries, enjoy offering advice or counsel, and love helping equip them in anyway I can. I'm currently accepting requests for Spring, Summer and Fall and would love to speak to your group! Use this handy booking form for your request and I'll personally contact you to follow-up. Look forward to hearing from you! 3 Comments Published by Terrace Crawford on 2/18/11 at 8:28 AM. A few months ago I felt God leading me to step away from the mic and hand it over to our teens. Specifically, I felt him leading me to help them tell their story. Soon after I met with our student leaders and told them I wanted to create a series called "STORY" and allow students to tell their stories each week. The leaders loved it! We've been running the series now for 5 weeks and its still going. And God is using it. Teens are sharing their faith, their struggles, and their hopes and dreams too. Teens can communicate to their peers - The second teens grab the mic they have an instant audience. Their peers listen to what they have to say. Teens invite their friends - You could get Justin Bieber to show up to your meeting and there wouldn't be as much excitement as you have when teens get to share. They invite their friends to hear their story. Just last week a young lady was scheduled to share her story and told me before our meeting "I invited the whole city!!!" God uses their story - We've seen some amazing things happen during our series so far. Students invite their friends, share their story with a captive audience, and lives are changed. God is using it! #1 Small Group App in the World! 2 Comments Published by Terrace Crawford on 2/16/11 at 7:53 AM. You've heard a lot about LIVE! curriculum from me if you've been reading this blog. 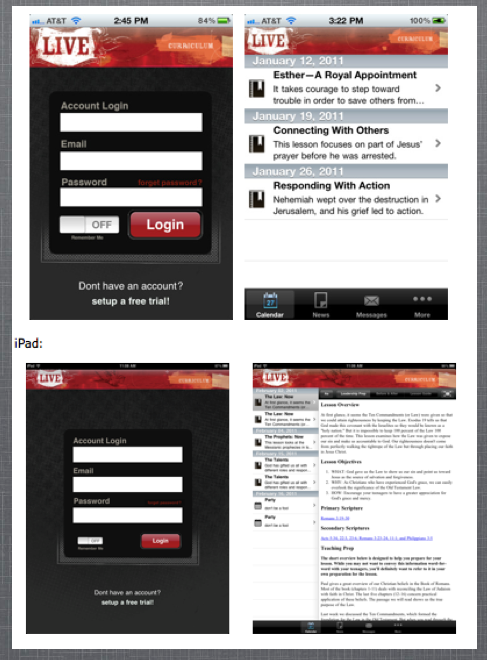 It's a great resource and youth workers love it. 1 Comments Published by Terrace Crawford on 2/10/11 at 2:19 PM. Look what YOU did. Because of the gifts to the water team we have brought safe water to 2 communities! Check out the celebration in Sri Lanka where one safe water system has just been installed. Another safe water system has been installed in Malindi, Uganda. Thousands of people now have safe drinking water because of your gift! THANK YOU. If you have not yet made a donation or joined my team, please help us. Go [here]. 1 Comments Published by Terrace Crawford on 2/7/11 at 10:09 PM. Visiting South Carolina for the third time in 2 weeks. My grandmother had a massive stroke just 2 weeks ago. She passed away January 30th. This dear lady, Nita, leaves behind an incredible legacy. I marveled at all of the attributes that were mentioned about her at the memorial service. I'll miss her prayers for me most. She was, quite possibly, my most faithful prayer warrior. Now I'm joining other Youth Workers from around the country for a mini-conference. I'm fortunate to be one of the presenters. God is doing some amazing things through students AND youth workers these days. Had an awesome time working with the Extreme Home Makeover crew this past Saturday. I'm listening to a TED talk right now while typing this. Multi-tasking. Watched the Superbowl last night. I wanted the Packers to take the victory and they did just that. My favorite commercials: Darth Vader, eTrade (with Peppers the cat), and Doritos. Yours? I had to sign off twitter last night because I got so frustrated with all of the critics. Why can't people learn to be more positive? Let's be fair... the Black Eyed Peas really put together a creative production for the half-time show. Their vocals weren't so good... but how many bands are really good live anyway? ... and poor Christina Aguilera didn't have a chance. Everyone knows if you flub a word (or a few words) to the national anthem you aren't patriotic at all and must be exiled to another continent. Hold. the. phone. I think I just found an App for The Oregon Trail. My friend, Paul Turner, shared these 10 iPhone Apps with me. I like these. #Fact: I have never rented a Red Box movie. Lots of new subscribers lately to the site. Welcome! If you are recommending the blog to others or sharing link love I got a couple words for you - THANK YOU. Leave a comment with a link to your site (or twitter) and I'll give you a shoutout. 1 Comments Published by Terrace Crawford on at 9:36 PM. 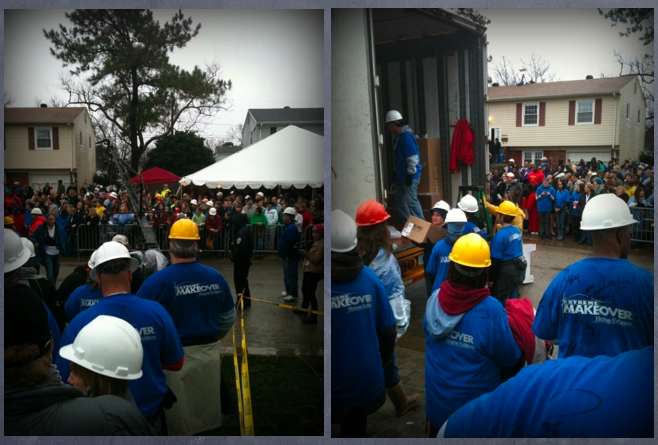 This past week Extreme Makeover [Home Edition] setup camp in Va Beach to build a house for a very sweet family. Their story is quite remarkable. The couple has adopted a number of children and spends countless hours per week working in a local food bank, among other charitable organizations. In addition to building the house there was a huge food drive coordinated for the local food banks in honor of the family's service to the community. 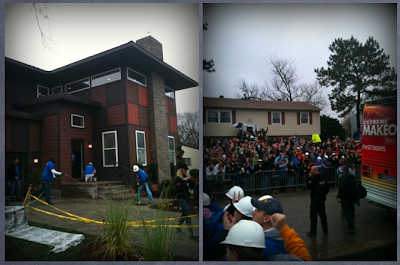 Not only did I snag a VIP ticket to the finale but I had was privileged to be able to work inside the house in the final hours before the big reveal. It was such an awesome experience. I can't wait until the show airs in a few weeks. The Best Way to Spend 2 Minutes? 0 Comments Published by Terrace Crawford on 2/2/11 at 8:16 PM. I saw this on Marko's blog. It's a website that encourages you to do NOTHING but sit and relax. It's quite possibly the best way to spend 2 minutes out of your day. 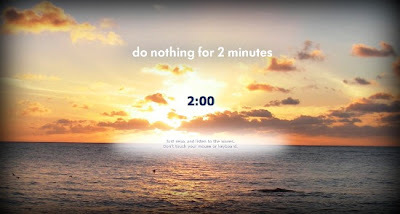 I enjoyed it... except when I did something during the 2 minutes besides doing NOTHING. Whatever you do... step away from your mouse. Trust me on that. 1 Comments Published by Terrace Crawford on 2/1/11 at 7:25 AM. A ministry partner & I conducted a survey of more than 500 teenagers a few years ago at a conference. The main question we asked was "What do you need most from adults?" I just re-read over the Top 10 list recently. Frankly, I don't think these answers would change if we were to do this survey all over again. . .
#1: Get to know us! Don't make judgements or stereotypes based on your first impression. #2: Believe in us! Never give up on us. #3: Treat us with respect. #4: Let us attempt great things! If we fail, provide support to us! #6: Be positive role models. #7: Make time for us. #8: Have fun with us! #9: Teach us what you know! #10: Be an advocate for us.